Product prices and availability are accurate as of 2018-11-12 22:04:05 GMT and are subject to change. Any price and availability information displayed on http://www.amazon.co.uk/ at the time of purchase will apply to the purchase of this product. Heartfelt MillieSimply place the amazing beating heart inside the head pocket and feel the heartbeat sensation. 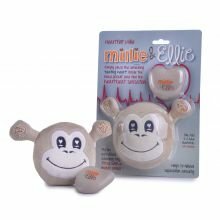 Puppy activated calming toy fitted with a motion sensor!Toys uses 2 x AAA batteries, not included, helps to relieve separation anxiety.